The Amigo Airsho, that’s right, Airsho without the “w”, held in Santa Teresa, NM is a great one day airshow. I was able to see it back in November 2014 and would gladly go again. Some big names on the airshow circuit come here, you can see performers like Dan Buchanan, the US Army Golden Knights, and the US Air Force Thunderbirds, but there are many excellent performers who don’t always show up at the MCAS Miramar and NAS Oceana airshows. Make no mistake, this is a fantastic day for aviation buffs. The airshow has been around for decades and used to be held in El Paso, TX at Biggs Field but has moved to the Doña Anna County Airport in Santa Teresa, NM. Although it normally happens at the beginning of November, check online before you go as it’s been cancelled a few times in recent years due to unspecified problems. However, if it’s on, book it! The above photo, A Texan’s Bottom, is a North American AT-6 Texan shot with a Canon 7D, Tamron 28-300mm f/3.5-6.3 Di VC lens at f/7.1, 1/640 sec, focal length 300mm, and ISO 100. All of these photos were shot with the Canon 7D and Tamron 28-300mm lens. One of the nice features about the Amigo Airsho is that you shoot it pretty well with a 300mm lens since you are fairly close in proximity to the performers. Likewise, you’ll want to bring earplugs for the same reason. The photo at left, Incoming, is a parachutist of the US Army Golden Knights on final approach to his marker. Incoming was shot at f/6.3, 1/640 sec, focal length 237mm, and ISO 125. I have since upgraded to the Canon EF 70-300mm f/4.5-5.6 L DO IS USM. About $900 cheaper than the Canon, the Tamron 28-300mm is a great lens and extreme bang for the buck! This was my first time seeing Rifle Airshows in the photo at right. Joe Shetterly (silver plane) is also an active duty US Air Force A-10 Warthog pilot, callsign “Rifle”. 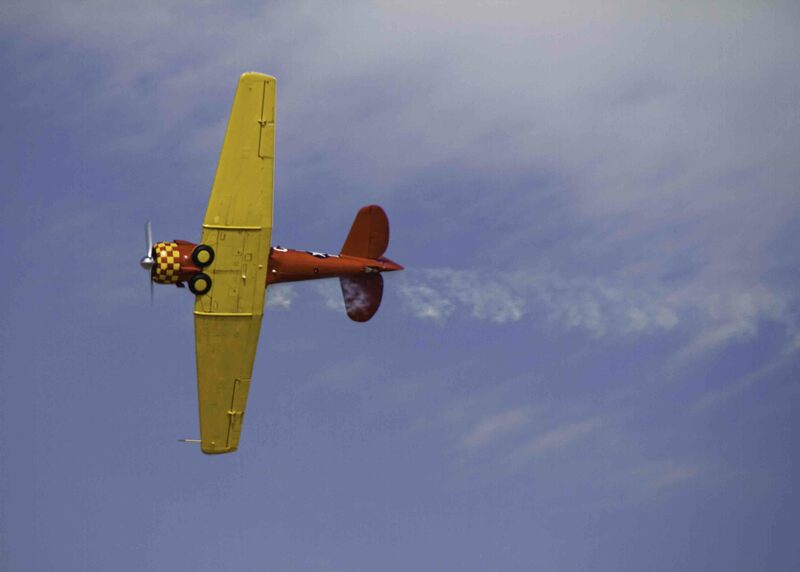 At this airshow Joe was flying with his dad Greg Shetterly (the white &red plane) and Joe’s mom was the announcer! This father and son team flew separate shows and one together as well, they put on an excellent show and I hope I’m able to see them again some time. This photo, Father and Son, was shot at f/7.1, 1/640 sec, focal length 300mm, and ISO 100. The best act of the day, in my two feet planting firmly on the ground opinion, was Franklin’s Flying Circus and Airshow. The aircraft at left is called Dracula and is flown by pilot Kyle Franklin. My first thought when I saw Dracula on the flight line was, “holy cow, this thing is all engine!” Yup, it is, and Kyle Franklin performs an ‘in your face’ airshow that is simply one of the best I’ve seen. It’s low altitude, low to the ground, high altitude and fast, all rolled in to one show! While I’d be happy to clean my breakfast out of the back seat of a Blue Angels F-18 cockpit after the privilege of a ride along, I’ll just watch Kyle Franklin from the ground. He’s simply the best pilot I’ve seen in years, check out his Drunk Pilot Comedy Airshow Act, the man has amazing skills! This photo, Diving, was shot at f/7.1, 1/640 sec, focal length 300mm, and ISO 100. The below photo is another of Kyle Franklin and Dracula, the photo is called Smoke of Dracula. Just as Kyle Franklin tries to capture the feeling of barnstorming and aviation of yesteryear, I was trying to do the same the same thing with a sepia effect, I don’t use this effect much. This was shot at at f/8, 1/640 sec, focal length 300mm, and ISO 100. If you’re looking for something to do at the beginning of November be sure to check online for the Amigo Airsho!